MIAMI, Florida (CNN) -- The Department of Veterans Affairs has launched an investigation into whether there is a connection between improperly sterilized endoscopy equipment and a veteran's positive HIV test. 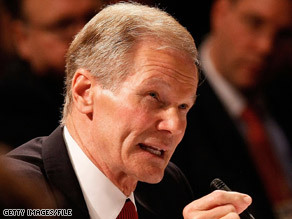 Sen. Bill Nelson, D-Florida, requested that the VA look into potential contamination at its facilities. This comes after more than 10,000 veterans were possibly exposed to HIV and hepatitis at three VA facilities while undergoing colonoscopies and other procedures with equipment that had not been properly cleaned. The VA sent letters to those veterans offering free testing for hepatitis B, hepatitis C and HIV. "The VA prides itself on being accountable, and we are extremely concerned about this matter, and as a result we have initiated an investigation," Dr. Michael J. Kussman, the VA's undersecretary for health, said in a news release Friday. "We have an obligation to provide those who have served and sacrificed for our Nation the care they deserve." Along with the positive HIV test, the VA says 16 other veterans have tested positive for hepatitis B and hepatitis C at two VA facilities. Of all the 17 positive test results, 11 were at the VA's Murfreesboro, Tennessee, facility, and six were from the VA's Augusta, Georgia, hospital. Thousands of other veterans are being tested at the VA hospital in Miami, and the VA says it is waiting to verify results there. Officials stress that the positive results don't necessarily mean the equipment is to blame. The VA is conducting an epidemiological investigation at the facilities to determine if the veterans who have tested positive for hepatitis have similar strains of the virus. Meanwhile, lawmakers are also calling for an investigation. In a letter last month to Gen. Eric Shinseki, the secretary of Veterans Affairs, Sen. Bill Nelson, D-Florida, requested that the VA Office of Inspector General "begin an investigation into the potential problems of contamination; whether any patient has contracted an infection from unsterilized equipment; and, most importantly, how we can prevent such problems from happening again." The VA says it's reviewing procedures at other facilities. So far, it says, it has encountered no additional problems. In the meantime, the VA has brought in additional personnel to help with testing and counseling in Miami, Murfreesboro and Augusta. It has also set up a toll-free number that VA patients and their families can call, 24 hours a day, seven days a week, for additional information: 1-877-575-7256. The VA says it will pay for treatment for the infected vets even if they didn't get hepatitis or HIV from the dirty equipment. "We are making sure to take corrective measures to ensure veterans have the information and the care necessary to deal with this unacceptable development," Kussman said.